Temporary tattoo measures approx. 1" x 1.25"
Now you can strike an uncanny resemblance to The Boy Who Lived! We are well-aware of how Harry Potter received his infamous scar and we'd never want you to go through that traumatic experience, although it would be nice to get all of the attention Harry attracts. He's hands down the most popular wizard in the wizarding world! Lucky for you, we have found a way for you to become his doppelganger, without drinking a nasty Polyjuice Potion! We didn't even have to visit Weasley's Wizard Wheezes joke shop to get this enchanting disguise either. Just use this officially licensed Harry Potter wig & tattoo set and you'll transform into Harry's twin. 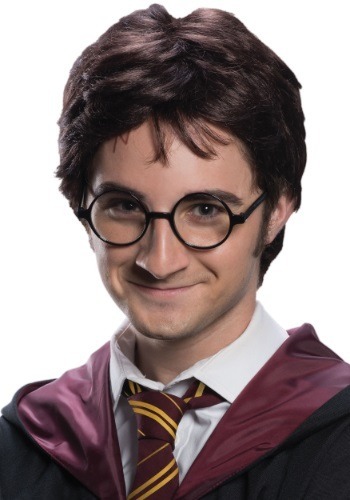 This wig will gives you Potter's signature schoolboy hairstyle and you'll also receive a temporary tattoo. That's right, you'll be sporting Harry's trademark lightning bolt shaped scar! With this disguise, you'll be able to fool the most skilled wizards into thinking that you are indeed, The Boy Who Lived. Just do your best to stay out of trouble because He Who Should Not Be Named will shoot you with an Unforgivable Curse if he thinks you're the real Harry Potter! Remember, even looking like The Boy Who Lived comes with some serious responsibility!